Polysil TG 500 anti-lime – is a deeply penetrating primer for damp, salt-containing substrates and an anti-lime treatment for new concrete which also acts as a liquid hardener for sealing slurries. 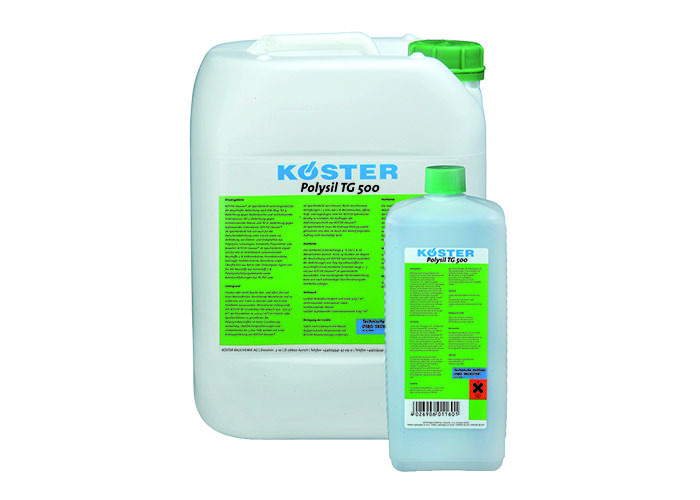 Koster Polysil TG 500 is an ‘anti lime’ coating product specially blended with Polymers and silicates which is applied by brush or spray application. Applying Polysil-TG 500 will not only reduce the amount of free lime leaching into the Cavity Drainage System but will also improve the water resistance of the basement structure by absorption into the structure and locking in the free lime. Can be used to strengthen and to protect mineral substrates and to reduce their absorbency, even of such problematic building materials as sandstone. Decreases the danger of new development of salt efflorescence, free lime egress, and raises the resistance of mineral substrates to freezing and thawing. Can also be used to harden sealing slurries. The British Standard for waterproofing BS 8102:2009 recognises the requirement where there is an inclusion of a Type C Waterproofing System or Cavity Drain Membrane System in a basement whether new build, retrofit or refurbishment for the system to be maintainable. When new concrete is introduced to structures, there is a risk of excess free lime leaching out during the curing process in the form of calcium hydroxide, this free lime, if untreated, can enter the Cavity Drainage System which can impede the flow of water and cause sump pump failure. We recommend during a Cavity Drain System installation that a silicfication pre-treatment of concrete be used to reduce the risk of free lime build up. Attention should be observed to dry pack joints often formed between the existing foundation and new concrete underpin, these are classic areas for free lime to infiltrate the structure and should be ‘locked’ down.